New for 2013! 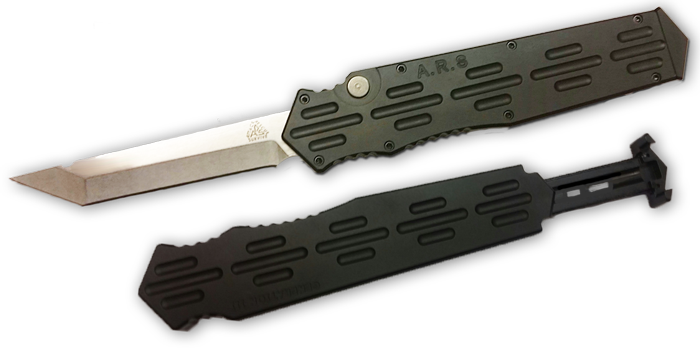 The ARS OTF Prototype is a rock solid out the front automatic knife you can depend on. The OTF has a razor sharp tanto blade made of 154CM steel that deploys forcefully and locks solidly into place with the push of a button. The handle is made of lightweight 7075T6 aluminum. Rear charging handle design makes for easy retraction. Coming soon will be custom editions using carbon fiber, G-10, inlay handles and Damascus blades. - Each knife is marked with "Prototype Gen 3"
By placing an order with us, you agree that you meet any or all of the following criteria. Last Ditch Blade, LLC will sell no such knives to any individual outside the State of Alabama without the above conditions being met. This does not apply to automatic knives made within the state of Alabama. Legal status of products: It is the responsibility of the buyer, not the seller, to ascertain, and obey, all applicable local, state, federal and international laws in regard to the possession, and use, of any item purchased from Last Ditch Blade, LLC. All equipment is sold subject to public law 90-351, title III, U.S.D., Section 2511, and any local, state or federal ordinances. Consult your local and state laws before ordering if you are in doubt. There are absolutely no sales to minors. By placing an order, the buyer represents that the products ordered will be used in a lawful manner and that the he or she is of legal age. Last Ditch Blade, LLC will not be held liable for the misuse of any product purchased from us, any of our distributors, or dealers. Also as no product is 100% effective against attack, Last Ditch Blade, LLC assumes no responsibility if a product purchased from us is not effective in preventing bodily injury, dismemberment or death.